Disc brakes are coming soon to a road bike near you. Back in the mid-1990's when disc brakes were being introduced for mountain bikes, who would have known then that there would be a time when nearly all mountain bikes would have them. And shortly after that, almost all cyclocross bikes. Now disc brakes are poised to enter the performance road bike market. It hasn't been easy for brake and bike manufacturers. In 2008 the International Cycling Union (UCI) prohibited disc brakes from being used on cyclocross bikes in international competition. While this rule may have discouraged the elite cyclocross market, brake manufacturers continued to develop cable disc brakes for use on mid level ‘cross and touring bikes. Despite the Avid BB7 being the de facto standard, Hayes, Shimano and TRP continued to hold their fair share of the market. And each company develop new products. There were, however, obstructions to producing higher level brakes. One was the UCI's ban on disc brakes. Few manufacturers were interested in building high end bikes that would not be allowed to use these components. Another obstacle was the lack of frames available with disc mounts. Why build more brakes if there are not enough bikes to put them on? That all changed at the end of 2011 when the UCI reversed its decision to allow disc brakes for use in international “cross competition. Since that time, 700c specific disc brake improvements has exploded. Avid redesigned its cable disc brake products with two road specific brakes. Shimano has also released new cable disc brake products. In 2011 a Utah based company, TRP, introduced the Parabox hybrid road disc brake. These brakes use cables to actuate hydraulic master cylinders to operate hydraulic brake calipers. TRP has also developed a cable actuated hydraulic brake caliper. In addition, bike manufacturers increased their production of disc brake bikes. And not only the big American companies. European companies such as Colnago, Pinarello and BH also took advantage of this moment to produce high end cyclocross bikes. In fact, in 2013 Colnago has introduced the C59, a top of the line carbon bike equipped with Campagnolo EPS and Formula hydraulic disc brakes. The builders that are really driving the road disc brake at this time are the custom frame makers. At the 2012 National Handmade Bicycle Show, top of the line cyclocross and road bikes were on display with disc brakes. So what is the high end road market waiting for? The high end road market (read: pro peloton) is waiting for top of the line brakes. These brakes also need to be integrated with shift levers. And the way the big three component manufacturers operate is on the trickle down theory. First they develop the best, and when that catches hold, they trickle down the technology to more affordable groupsets. The opposite of the way smaller companies operate sometimes. The high end road market must wait no longer. For 2013, SRAM has become the first of the big three to release a high end hydraulic brake/shifter set. Named “Red 22”, it features hydraulic disc rim brakes with 160mm rotors and a new 11speed cassette. 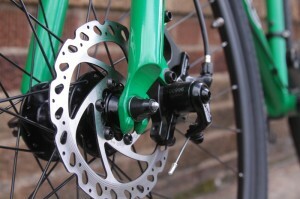 Soon road riders will be experiencing all the same advantages of disc brakes that mountain bike riders have for years. These include more powerful braking, more consistent in all conditions wet or dry. Since hydraulic fluid does not compress, modulation (control) of the brakes is also increased. Disc brakes are also a boon to carbon rim makers because they will no longer have to work around the high surface temperatures of the braking surface. There are, however, some hurdles for road disc brakes to overcome. For example, even after 15 or more years, mountain bike disc brakes are not perfect. Many mountain bikers have learned to put up with loud, screechy brakes or the “ching, ching, ching” of a caliper that needs to be aligned because of the braking power it affords them. Road riders will likely find this to be unacceptable. For this reason, disc brake designers have a task ahead of them. Also, many mountain bikers needed an adjustment period, because disc brakes are much more powerful than rim brakes. On solo rides it can be easy to learn how much brake to apply. However, on a group ride or in a peloton this disparity in braking power between riders could be hazardous. Finally, current road bikes are not adaptable to disc brakes so in order to use them requires nearly a complete bicycle upgrade. Many of these challenges are the same ones that mountain bikes faced 20 years ago. Look at where brake technology is now. This is only the first year of true road hydraulic disc brake availability. It's going to take a while. For those that do not have a disc brake compatible bicycle, be patient and save your pennies. For those that do, it may be a good time to take advantage of all the great new brakes that have been developed in the last year.